Editor’s Note: Like many people, I thought just throwing out the water from cooking high oxalate foods like chard or kale was enough. I was wrong. It has been contributing to my frequent brain fog, lack of energy, vulvodynia, cystitis and fibromyalgia like symptoms. It can cause much more havoc than that–and not just kidney stones as many of us are lead to believe. Read this fantastic article from by Janie A. Bowthorpe, M.Ed. in her blog, Stop the Thyroid Madness. Just a few years ago, my husband and I were doing some restoration in our kitchen and dining area, especially painting. As a result, I was eating “quick foods” daily and quite a lot for weeks on end, and one quick food in particular was cocoa-covered almonds. I reasoned with myself that nuts are good for me, and I was also getting my favorite food on top of it–chocolate in the form of cocoa. Additionally, I was drinking a lot of black “sun tea” every single day, making it on the back deck every day or two. i.e. a high oxalate drink. I would also eat a raw spinach salad often to get my greens in, week after week–easy to fix. Another high oxalate food. And I would eat very dark chocolate on top of it all as a nice treat, daily and week after week. Another high oxalate food. And after several weeks of these daily “convenience foods”..and a lot of them all the time…all hell broke loose. Oxalate, aka oxalic acid, is a naturally-occurring and reactive molecular substance found in a variety of foods, especially if the food is related to plants. That can include all seeds and nuts, most greens, many fruits, even chocolate. Even the Vitamin C we supplement with, or the fructose in the fruits we eat, can convert to oxalate! And our body does a great job…usually…of ridding our bodies of unneeded oxalate. You have a very good bacteria which will digest it, turn it into something less irritating, and move it out via your stools. In fact, the body does such a good job that you may be the way I was–having never heard of it or any reason to think of it. 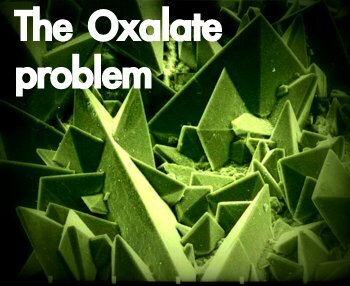 When high oxalate foods are combined with calcium rich foods or supplements, you then create oxalate crystals. Picture razor sharp, jagged edges and you have oxalate crystals (see photo), which can cause a lot of pain as they are eliminated via your stools. These nasty crystals can also form in your lungs, or your kidneys, or your joints and bones, or blood vessels, and even your brain. And any of the latter can result in inflammation. If oxalates combine with iron, you then have oxidative damage, plus your iron levels will go down. There is also some suspicion that excess oxalates can negatively affect your thyroid. The solution if you have overdone your consumption of oxalates? Experts state to switch to medium oxalate foods (you’ll begin detoxing the oxalates), then make your way down to low oxalate foods (when you think you are ready)….and avoid the high oxalate foods! The following link has downloadable lists of the content of oxalate in foods: http://www.lowoxalate.info/recipes.html. Generally, high oxalate foods include almonds, spinach, beet greens, okra, sweet potatoes, dried figs, refried beans, lentils, pecans, peanuts and peanut butter, pistachios, sesame seeds, chocolate and cocoa, green peppers, blackberries, raspberries, grits, whole wheat flour products, bran and other cereals, black tea and instant coffee…and you’ll see more in high oxalate lists, but you can especially trust the testing done by the Yahoo Low Oxalate group information over most lists. A mistake I made: I switched immediately to low oxalate…and let me tell you, the detox was MISERABLE for weeks. Don’t do what I did. Slow down. Start with medium oxalate goods. Let your body take care of it a little at a time. Support your liver and kidneys. It can take many weeks. But more importantly, do your own research!!! This is just my experience and information based on research I did. Or, if you haven’t crossed the line and don’t want to, the answer is “moderation”. I have eaten chocolate, almonds, and nuts for years without an issue, simply because I didn’t overdo it…until I did. So as with goitrogens and any other potentially harmful foods, the key is in moderation and not getting into a rut like Janie Bowthorpe tends to do—eating one favorite food over and over and over…. UPDATE: I did it to myself again!! Just three years after I got myself into trouble as explained above, I did it again. I overate high oxalate foods like chocolate, over and over and over. As a result, I found myself with high ferritin–a key sign of inflammation–and thus low iron. And my particular sign again that my body was trying to get rid of excess oxalates?? Hives. And I had to go through the messy process of detoxing that high oxalate all over again, which isn’t fun. The lesson that is underscored is not to eat the same thing over and over and over, day after week after month, which I tend to do if I like something….like dark chocolate. 🙂 Moderation is key! Wish I had known all this before I developed kidney stones! Sorry to hear that! Unfortunately kidney stones are all too common a condition–and so very painful! Am thinking of posting some herbal remedies that are reported to help dissolve stones. The interesting thing is that the oxalates can affect more of our systems than just the kidneys.